Membership of Knighton Heath GC offers you a wide variety of benefits irrespective of whether you already have a handicap, wish to obtain one or simply play social golf. The club has four main sections:- Men, Ladies, Seniors, Juniors and is committed to full equality. The majority of our members are Full members and for 2018-19 the annual membership fee is £1096.00 for those over the age of 35. For those between 19 and 34 the annual subscriptions range from £395 to £844 per annum. The normal calendar has a monthly medal and/or stableford competition. These competitions are generally held on a Wednesday, Saturday and Sunday with each competition being run as an individual event. The majority of this section meet regularly on a Tuesday morning and normally sees some form of competition for the members. Subject to other bookings time normally exists for social golf after the competitions. Our ‘alternate day’ ladies who are unable to play on a Tuesday have an opportunity to play competitions, or social golf, with other ‘working’ ladies at weekends. As from 2019, the majority of the club trophy competitions will be played over two days, a Sunday and a Tuesday. During the remained of 2018, where possible, trophy competitions will be played over the two days. This section is by far the biggest section within the club and they would meet regularly on a Monday morning. This is generally the time they play their internal competitions whilst inter-club matches are normally played on another weekday. OVERSEAS* £ 811.00 Existing full member who has another residence overseas in which they live for a minimum continuous period of 3 months each year. HM FORCES* £ 559.00 members of the Armed Forces in fulltime service, must produce a valid armed forces ID card. 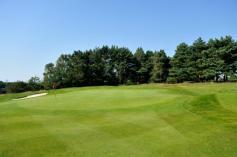 FLEXIBLE* £ 186.00 pay & play, weekdays - £16 for 18 holes, weekends £21 for 18 holes, active handicaps, limited competitions. SUSPENDED existing members due to illness, operations etc, transfer on approval by the Management Committee, together with a medical certificate. Refer to club bye-law 6. Age qualifications relate to age at 1 July. Click HERE to download the Membership Pack which includes an application form. Click HERE to download a Premium Credit monthly direct debit application form.